The result for VITEEE 2018 has been announced on April 27, 2018. The candidates can check their result by entering Application Number and Date of Birth. It is the engineering entrance examination for VIT University B.Tech admission. It has been held at all India level in 124 cities. The score of the exam will be considered for admission in VIT Vellore, Chennai, Bhopal, and Amravati Campus. The candidates who have qualified the exam, now have to appear for the counselling and the dates for it has also been announced. 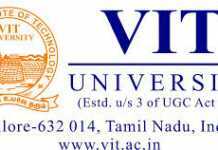 The VIT University has conducted VITEEE 2018 from April 04 to 15. Candidates could apply for it until March 18, 2018, in online or offline mode. After the registration, the slot booking portal was opened. Through slot booking of VITEEE 2018, the candidates can able to reserve a test date, center, and time. As soon as the booking is done, the admit card is available for download. The official website for VITEEE is vit.ac.in. 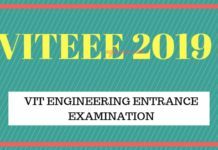 Candidates can check all the important detailed about VITEEE 2018 like eligibility, syllabus, exam pattern, and more from this page. Latest: Request for withdrawal can be now be initiated, candidates interested can go to the “counselling” page provided below. Also, for freshers balance fees payment Click Here. VIT University will conduct 3 slots of VITEEE every day. The slots will be held from 9:00 to 11:30 am, 12:30 am to 03:00 pm, and from 04:00 pm to 6:30 pm. The University will ensure that the exam do not collide with JEE Main on April 15, 2018. 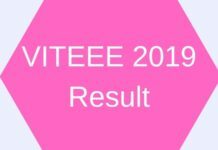 VIT University has announced the result of VITEEE 2018 on the official website. Candidates will have to enter Application Number and Date of Birth to access the login. The result will state the All India Rank secured by the candidates. The University uses the equating methodology to determine the result. The University usually conducts two rounds for counselling. However, it may also conduct more rounds if seats remain vacant. VIT allocates the seats on the basis of AIR secured by the candidate. Counselling admit card for VIT university has been released. Candidates can check it from the quick link provided above. VIT University does not grant admission other than on the basis of VITEEE merit. The application form for VITEEE 2018 is available online and offline. Candidates can choose any medium to submit it. To apply online, the candidates need to click on the link above and to access the offline form contact the University or the designated post offices. Candidates can check the list of designated post offices from here. VIT University conducts VIT engineering admission exam in a multiple session. The University allows candidates to choose a slot for themselves. Slot booking is exactly like booking a movie show. Candidates just need to access VIT Online Test Booking System (OTBS) and then choose a test center, date and time for taking the exam. The point to note is that the candidates will be doing slot booking of VITEEE 2018 on the first-come-first-served basis. The window for booking remains open for a limited period of time. Hence, the candidates must do the booking as soon as the portal starts functioning. The issuance of admit card begins after the successful slot booking. The system automatically generates admit card after the successful booking. Candidates may download the generated admit card by clicking on the print option. 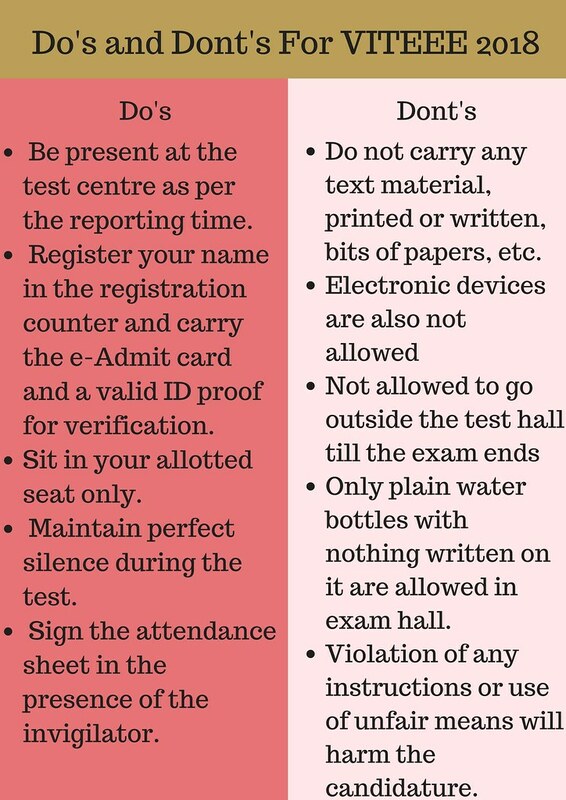 On the exam day, the candidates will have to carry as a print copy, on an A-4 sheet. E-admit card will be unacceptable. Exam Mode: VIT University only conducts VITEEE in computer based mode. The language of Exam: VIT University will present the question paper only in the English language. Question Type: All the questions will be of objective type. Candidates should prepare according to the syllabus of VITEEE 2018. Through the syllabus, the candidates will know the amount of time and effort to be given to each chapter. Candidates can use the link below to check VITEEE 2018 syllabus for Physics, Chemistry, and Mathematics. Age Limit: The candidate should have been born on or after July 1st, 1996. The VIT University offers various B.Tech programmes at its various campuses in different states. Candidates can check all the offered branches, in all the campuses, from the table below. For more information regarding VITEEE 2018, download information brochure.